From the earliest days of the Church, efforts have been made to present the beliefs of the faith clearly and completely. Much of the New Testament can be seen as catechetical, as can many of the writings of early Church fathers such as Origen and Augustine. The word catechism is applied to a written work that presents a full summary of beliefs that is created as a means of passing on those beliefs to others. Types of catechisms: Over the centuries, there have been many types of catechisms. Some have been written as narratives, attempting to create a story of the faith that attracts believers to the beauty that resides there. Others, like the Baltimore Catechism, are written in a question-and-answer format that is designed to promote in children the memorization of specific beliefs. Some catechisms have been written for the benefit of clergy and teachers, to ensure that they have at their fingertips the completeness of faith. Others have been written for use by the uneducated and the young, that they may learn the Church’s beliefs in a simplified language. The CCC is formally known as a “major” catechism. It was written to be a “sure guide” to the faith for those who teach the Church’s message and for those who wish to develop “minor” catechisms to be used by children and those seeking initial understanding. The CCC is written in a narrative form and does not use the question-and-answer format. The audience: Catechisms are always written for particular audiences at particular times in history. While revelation was completed in Jesus Christ, and the Church’s faith doesn’t change over time, the language in which the faith is expressed does develop and change, as do the ways in which people use catechisms. Thus, it is important that official expressions of the faith—catechisms—be updated regularly so that the message of faith can be shared in such a way that people can understand it more fully. Blessed John XXIII was aware of the tremendous changes that were taking place in the world following the Second World War. So he called on the fathers of the Second Vatican Council to guard and present Christian doctrine in such a way that it was most accessible to the world—Catholics, other Christians, and all people of faith. The documents of the Second Vatican Council expressed the faith of the Church clearly for the new age. While the development of an official catechism was discussed at the council, the bishops decided not to create a new catechism at that time, choosing instead to let the Church live with the council’s teaching and make them into a living reality. So it wasn’t until 1985 that the Church gave serious consideration to the creation of such a catechism. The CCC proposed and written: The CCC was first proposed at a synod of bishops gathered to reflect on the twentieth anniversary of the conclusion of the Second Vatican Council. Cardinal Bernard Law of Boston made the proposal that a new universal catechism be developed to replace the then still official Catechism of the Council of Trent, which was created in 1566. Recognizing that such a work would be helpful, the bishops at the synod accepted the proposal, and Pope John Paul II approved the CCC’s creation. The CCC was written by a commission of scholars appointed by Pope John Paul II. The scholars began their work in November 1986 and completed it in February 1992. The Holy Father approved the text and released the first “provisional reference text” to the world in October of that year to show that the CCC was a product of the Second Vatican Council, not an addendum to or in opposition to the teachings of the council. The first official English translation of the provisional CCC was published in 1994. Because the original CCC was written in French, it had to be translated into Latin, the official language of the Church. The official Latin edition (the “typical edition”) was published on August 15, 1997, and was translated into English later in 1997. 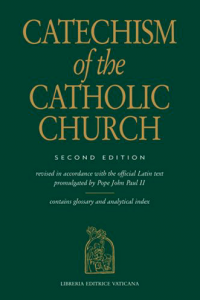 The second edition of the CCC published by the United States Conference of Catholic Bishops (USCCB) also contains a Glossary and Index Analyticus that were published in 2000. For a fuller history of catechisms and catechesis, go to usccb.org and search Informative Dossier on the Catechism of the Catholic Church. 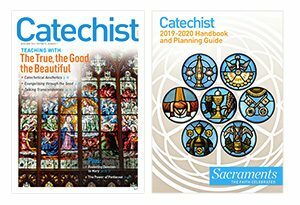 Because it is a reference text, the CCC was created to guide the development of other catechetical materials that would be used with specific audiences. To facilitate this usage, the USCCB has created a subcommittee of bishops that reviews catechetical texts to ensure that the texts are in conformity with the Catechism, meaning that what is presented in the text is complete and accurate according to the CCC. The subcommittee reviews only those texts voluntarily submitted, and reviews only in relation to the CCC. The subcommittee does not “approve” text and makes no statement about the text’s methodology or appropriateness for use by any group. * “Part One: The Profession of Faith” takes the key themes from the Apostles’ Creed and explains them. * “Part Two: The Celebration of the Christian Mystery” explains the Church’s liturgy and Sacraments. * “Part Three: Life in Christ” examines how we are to live guided by the Holy Spirit, the Beatitudes, and the Ten Commandments. * “Part Four: Christian Prayer” examines the role of prayer in our lives and how we are to pray. It includes a reflection on the Lord’s Prayer. These four parts are often called the “four pillars” of the Catholic faith. The CCC contains numerous footnotes, along with references to the teaching from the Church’s storehouse of traditions and from authoritative Catholic statements. The CCC also is cross-referenced to itself; numbers in margins indicate where else in the book a particular topic is addressed. While not one of the organizing principles of the CCC, Sacred Scripture is an essential component of its makeup. Paragraphs numbered 101–141 present a spiritual exegesis on Scripture and show how the Church’s Tradition flows from Scripture. This treatment of Scripture is taken from Dei verbum, the Second Vatican Council’s Dogmatic Constitution on Divine Revelation, which emphasized that Scripture should be “read and interpreted in light of the same Spirit by whom it was written” (Dei verbum, n. 12). In addition, Scripture is used continuously throughout the CCC and referenced repeatedly. Because the CCC was created to guide the development of other texts, it was not intended to be used as a general catechetical text. That doesn’t mean that it can’t or shouldn’t be used in this way—especially for adults—only that one shouldn’t assume that the CCC replaces other catechetical resources. Like catechisms, catechetical resources are developed for particular audiences at particular times. Catechetical materials for first-graders who are just beginning to read will be different from those created for twelfth-graders who can think abstractly and study a topic thoroughly. While it is important that materials for all learners are accurate and complete—which the CCC helps to ensure—they must also be created with the developmental needs of the learner in mind. Check your textbook references to the CCC: Most catechetical textbooks are designed to teach certain segments of the CCC. These segments are frequently listed in the teacher’s edition, along with commentaries on the CCC written with the teacher of a certain grade level in mind. By all means, when you come upon these references, look them up and read them. 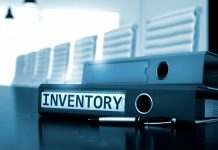 Check out the footnotes and references and check other sections of the CCC that pertain to the topic. Become as familiar as you can with the contents of the CCC: the better you know it, the easier it will be for you to interpret it faithfully to those you teach. Study the CCC on your own: When you come upon a topic about the faith that you don’t understand, go to the Catechism and study what it says. Many dioceses encourage their catechists to use the Catechism as a source of reflection and meditation so that they can continue to grow as persons of faith. You might pick a particular section for a season of the year, such as Advent or Lent, and then read and reflect on one or two paragraphs of the CCC each day. You will be surprised at how this will help you grow in your understanding of the faith. Pray with the CCC: The CCC also provides a wonderful vehicle to guide and shape prayer. In addition to the fourth part, which teaches about prayer, there are opportunities throughout the Catechism for the reader to stop and pray upon the mystery that is presented there. Use the CCC as a reference tool: Have it at hand anytime you prepare or teach a lesson. If someone asks a question, invite that person to look up the topic in the one sure source for what the Church believes and teaches. The Catechism of the Catholic Church is a wonderful gift to the Church. The more it is used, the greater the gift becomes. We celebrate this twentieth anniversary of its publication with joy and look forward to using it for many, many years. Dan Mulhall currently serves as the Director of Professional Development and Hispanic Catechesis for RCL Benzinger. He holds an MA in Theology from the Catholic University of America (1979) and an MA in Adult Christian Community Development from Regis University (1989). In Porta fidei, Pope Benedict XVI wrote: “…the Year of Faith will have to see a concerted effort to rediscover and study the fundamental content of the faith that receives its systematic and organic synthesis in the Catechism of the Catholic Church” (n. 11). Daniel Mulhall presents a thumbnail sketch of the history of the Catechism of the Catholic Church. He gives us an opportunity to appreciate a treasure house of wisdom: “In its very structure, the Catechism of the Catholic Church follows the development of the faith right up to the great themes of daily life. On page after page, we find that what is presented here is no theory, but an encounter with a Person who lives within the Church” (PF, n. 11). 1. What has been my past experience with the Church’s catechisms, e.g. Baltimore Catechism? What impact did that experience have on my forming a personal relationship with Jesus or on discovering my faith at a deeper level? 3. What does the word catechism mean? What is the relationship of the CCC to the Second Vatican Council? 4. What are the four parts of the CCC? 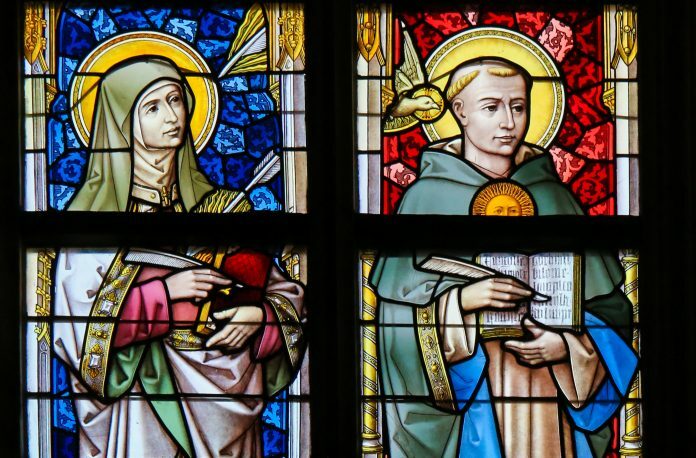 Why are they called the “four pillars” of the Catholic faith? 5. What new insights have I gleaned about the CCC from reading and reflecting on Daniel Mulhall’s article? How might this enhance my application of the CCC in my ministry? 6. Why do catechisms need to be updated regularly? Is this a surprise to me? What questions do I have about this idea? 7. Read “The Apostolic Constitution on the Publication of the Catechism of the Catholic Church” called Fidei depositum (go to vatican.va and search fidei depositum). What new insights do I glean for appreciating the developmental process for publishing the 1997 CCC? 8. Why is the CCC a reference text? What does this mean for me as a catechist? 1. The CCC is available online from the United States Bishops Conference (go usccb.org and search Catechism of the Catholic Church). Catechists may find it more helpful to have a hardcopy for regular study, prayer, and reference. During the next few months, plan for an intentional, conscious journey through the CCC. You do not have to read it cover to cover, but select articles out of each section of the four parts and allow them to be the portal for rediscovering your faith. (Go to vatican.va and search note for pastoral recommendations for the year of faith, see III). 2. The United States Conference of Catholic Bishops published United States Catholic Catechism for Adults. It is a more readable text, reflecting back upon the CCC. Purchase a copy for your reference. Invite several catechists or adults in your parish to meet regularly to read, study, prayer, and dialogue around the deep insights presented in the catechism.